It seems like you can't open a cycling magazine, read a running forum or speak to an endurance enthusiast without being drawn into a discussion about beetroot juice. With article headlines such as, “Power to the beetroot - PB up, BP down” and “Beetroot Juice: The Drink of Champions” becoming evermore common, I thought it would be a good time to take a look at some of the research and determine whether these claims are justified. As such, the aim of this article is to discuss all things beetroot and try to find out if it really is “The Drink of Champions”. Beetroot Juice - What’s so special? In order to do this, we first need to establish what beetroot juice contains to make it stand out. The answer is simple, an exceptionally high concentration of nitrate; 500ml of this unique-tasting juice contains approximately 370-500mg of nitrate. To put this concentration into perspective, you would have to eat 200-300g of beetroot, spinach or lettuce to obtain a similar quantity (Table 1). Just before we go any further, some of you are probably wondering, how do we know it is the nitrate in beetroot juice attracting all the attention and not something else? Well, a nitrate-depleted beetroot juice was developed, removing the nitrate but leaving the taste (beneficial for disguising the supplement during experiments) and all other active compounds inside. Subsequent studies found no positive effects on exercise performance after ingestion of the nitrate-depleted placebo. This, in comparison to normal beetroot juice eliciting performance-enhancing effects, has allowed researchers to isolate the nitrate as the beneficial compound and not the anti-oxidants, polyphenols or other metabolically active compounds. So now we know the what, how about the why? Dietary Nitrate – Why is it important? Firstly a quick warning, I will now dig into a little bit of science, but stay with me, I have done my best to simplify the physiological terms and processes! Endogenously (produced internally in the body) through what is called the L-arginine pathway, during which L-arginine reacts with oxygen via specific enzymes to produce NO. However, under conditions of low oxygen availability (hypoxia), which can occur during exercise, this pathway is impaired. From dietary sources high in nitrate (see Table 1). Upon ingestion, nitrate is reduced to nitrite by bacteria in the saliva. When swallowed some of the nitrite is reduced to NO in the stomach, whereas the rest enters the circulation, resulting in an increase in plasma (blood) nitrite levels. The additional plasma nitrate can be further reduced in the muscles during certain conditions, specifically hypoxia, to produce NO. The L-arginine pathway was initially thought to be the only pathway of producing NO, however, it was recently discovered that increasing the amount of nitrate from the diet could significantly alter the concentrations of NO in the tissues. Thus a diet with a high nitrate content can complement the endogenous L-arginine pathway, especially under conditions of low oxygen availability. To put this in layman’s terms - drinking beetroot juice provides a practical method to increase the body’s concentration of NO (the important molecule for muscle function). Now we know the what and the why, does it truly facilitate exercise performance? It was first discovered that dietary nitrate could alter the physiological responses to exercise when Filip Larsen and his colleagues (2007) reported that 3 days of sodium nitrate supplementation increased plasma nitrite concentrations and reduced the oxygen cost of sub-maximal exercise. These novel findings developed a vast amount of interest, as a potential reduction in the oxygen cost of exercise – i.e. an improvement in muscular efficiency - could lead to significant improvements in endurance performance. Consequently, this interest led to further studies assessing dietary nitrate supplementation and exercise performance. In a study by Bailey et al. (2009), the effects of 6 days supplementation of 500ml of beetroot juice on sub-maximal and high-intensity exercise were examined. During the beetroot trial, plasma nitrite concentrations almost doubled, the oxygen cost of sub-maximal exercise was reduced and exercise time to exhaustion increased by 16%. It needs to be highlighted that dietary nitrate intake was restricted throughout the study. Therefore, the difference in the oxygen cost of exercise after beetroot supplementation may have been due to an elevated oxygen uptake during the control condition, as a result of the lower nitrate content in the diet, and not due to the supplementation itself. Nevertheless, to think that one small dietary change, drinking 500ml of beetroot juice for 6 days, could elicit a 16% increase in time to exhaustion is of considerable interest. To follow this study up, Vanhatalo et al. (2010) assessed the effects of both acute (2.5 hours before performance) and chronic dietary nitrate supplementation on moderate-intensity and incremental cycling exercise. In comparison to the previous study, nitrate intake from the diet was not restricted. Even though this was the case, the findings were similar, a reduction in the oxygen cost of exercise due to an acute dose of beetroot juice, and an improvement in incremental exercise after continued supplementation of beetroot juice for 15 days. Although these studies demonstrate improvements in exercise capacity, the protocols employed, such as time-to-exhaustion, do not necessarily represent athletic performance. Therefore, do these results translate to real-life performance? Fortunately for us, more recent research has been completed using protocols with closer relevance to athletic performance. A study by Bond et al. 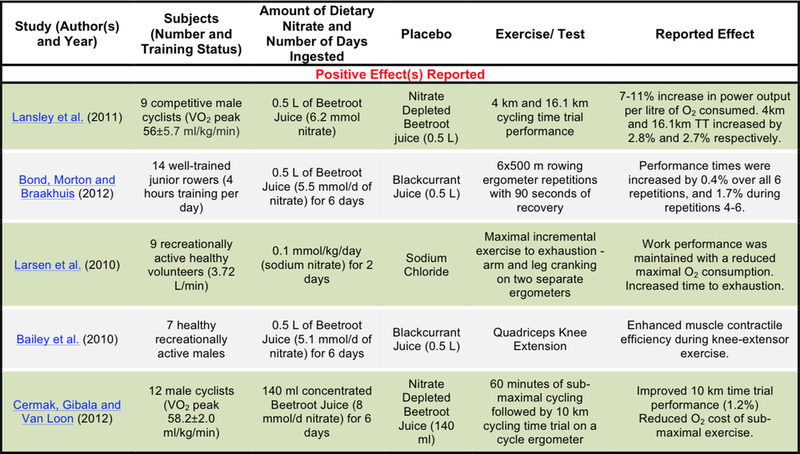 (2012) found 6 days of 500ml supplementation of beetroot juice improved 6x500m rowing performance by 0.4% across all the repetitions, and 1.7% over repetitions 4-6, in 14 junior trained rowers. A blackcurrant juice placebo was used during this study allowing the participants to identify between the treatment and placebo, whether this had significant impacts on the results is unclear. Additionally, Lansley et al. (2011) assessed the effect of 500ml of beetroot juice, 2.5 hours before 4km and 16.1km time trials in 9 moderately trained cyclists. It was reported that beetroot juice supplementation improved both time trial performances by 2.8% and 2.7% respectively, concluding that the cyclists were able to produce a higher power output for the same oxygen cost. Increases of 2.7% in a cycling time trial are astonishingly large. To put this into perspective, if Tony Martin the silver medalist in the London 2012 Individual Cycling Time Trial drank 500ml of beetroot juice before his race and obtained a 2.7% improvement in performance, he would have beaten Bradley Wiggins by 18 seconds and won the gold medal! Evidently there are a lot more aspects to consider, but you get my point – it’s a massive increase for such a small dietary intervention. So, all of this seems positive so far? But there is one underlying trait that is often overlooked in regards to the effectiveness of dietary nitrate supplementation - the training status of the participants. It appears there is a training status ‘threshold’ above which the ergogenic effects of beetroot juice seem to diminish. Athletes that I would class as highly trained, with a VO2 max/peak in the range of 60ml.kg.min or higher do not seem to benefit from supplementation of dietary nitrate. Obviously it is naive to place a figure - 60ml.kg.min - on the efficacy of dietary nitrate supplementation, as it could be highly individualised to the athletes themselves, the event they are competing in and their habitual intake of nitrate. Regardless, the potential ergogenic effects of dietary nitrate supplementation do not appear to be present in athletes above this level of training status. In a study by Christensen et al. (2013), 10 elite level cyclists - with an average VO2 max of 72.1ml.kg/min - were supplemented with 500ml of beetroot juice for 6 days. Plasma nitrite levels were significantly elevated above the placebo condition, however, there were no improvements in time trial or repeated sprint performance. Additionally, Wilkerson et al. (2012) found no improvement in 50-mile time trial performance in 8 well-trained cyclists (average VO2 max - 63ml.kg.min) following 500ml of beetroot juice supplementation. Other studies that recruited highly trained athletes and found no benefits on performance include Peacock et al. (2012), Bescos et al. (2011) and Cermak et al. (2012). Please see end of article for a summary table of studies conducted. Why the lack of improvement in highly trained athletes? The reduction of nitrate and nitrite to NO (the molecule that has a key role in muscle function) occurs under hypoxic conditions. However, as highly trained athletes have greater mitochondrial and capillary densities, the occurrence and severity of hypoxia during endurance performance could be minimised and therefore the reduction of nitrite to NO may be limited through this pathway. In addition, highly trained athletes have greater resting levels of plasma nitrite and NOS (the enzymes responsible in the L-arginine pathway). A greater resting level of plasma nitrite, which can be converted to NO, and superior ability to produce endogenous NO through the L-arginine pathway, provide a good foundation to explain why dietary nitrate supplementation may not facilitate endurance performance in highly trained athletes. As you might have been thinking – if oxidative metabolism is decreased, then anaerobic metabolism must be increased – this would be the most obvious explanation for the improvement in muscular efficiency, but this does not appear to be the case. The reduction in the oxygen cost of exercise due to dietary nitrate supplementation is not coupled with increases in blood lactate or a decrease in phosphocreatine (PCr), and therefore cannot be due to an increase in anaerobic metabolism. As of yet the mechanisms underpinning why dietary nitrate improves muscular efficiency are not completely understood, however there are a few theories. ATP is our ‘chemical energy’ and is constantly recycled in the muscles. Both ATPases and ATP synthase control ATP turnover (breakdown and reformation). An increase in NO, through dietary nitrate supplementation, can reduce the activity of actomyosin ATPase and Ca+ ATPase, two enzymes that are fundamental in ATP turnover. This reduction in the activity of key ATPases may decrease the accumulation of ADP and Pi and in-turn reduce oxidative phosphorylation – the process of reforming ATP – which could explain the increase in muscle efficiency and the reduction in the oxygen cost of exercise. Another theory is that nitrate supplementation improves mitochondrial efficiency. During ATP synthesis protons are pushed through the electron transport chain, however some protons can leak out of the mitochondrial membranes – this is known as proton leakage. Dietary nitrate supplementation appears to reduce proton leakage, in-turn increasing coupling-efficiency. In simpler terms, NO decreases the amount of energy lost during ATP reformation and increases the amount of ATP produced per unit of oxygen, potentially explaining how a higher power output is maintained for a lower oxygen cost. One final theory! As nitrate is a potent vasodilator, the widening of blood vessels could lead to an improved delivery of blood flow to the working muscles and increased muscle oxygen availability. This could explain an improvement in exercise performance, but not the reduction in the oxygen cost of exercise. Should I use dietary nitrate supplementation during training? To my knowledge, no studies have assessed the effect of dietary nitrate supplementation on training performance and subsequent adaptation. Therefore, this paragraph is simply my thoughts and deductions, ill leave you to determine your own conclusions (please share your practical experiences or leave any comments below). The reported reduction in the oxygen cost of sub-maximal exercise could reduce the stimulus and stress placed on the body, in-turn blunting training adaptations. Additionally, beetroot juice contains both phytochemicals and anti-oxidants that neutralise important molecules, known as free radicals. A decrease in free radicals, which are fundamental for gene expression and cellular adaptation, could also reduce adaptations. On the other hand, the ability to produce a higher power output for the same oxygen cost might facilitate a greater training intensity and promote superior adaptations. Also, the increase in NO availability may further stimulate mitochondrial biogenesis. Due to the lack of research, I would not recommend dietary nitrate supplementation for training purposes, for the sole reason that it could blunt adaptations. Does a pre-exercise meal affect the efficacy of supplementation? As plasma nitrite concentrations peak 2-3hours after ingestion of beetroot juice, this time period may well coincide with an athlete’s pre-competition meal. This begs the question, would a meal reduce the effectiveness of the supplementation? Luckily, a study in 2012 (Cermak et al.) required participants to eat a standardised breakfast 15 minutes after taking their beetroot juice supplementation. The increases in plasma nitrite concentrations were similar to those reported by other studies that did not allow food intake between supplementation and exercise. This is an extremely positive finding for athletes as it means consuming beetroot juice alongside a pre-competition meal won’t affect the reduction of dietary nitrate to nitrite and the effectiveness of supplementation. Even though this should be fairy self-explanatory, I would never prioritise any supplementation over your pre-exercise meal. To summarise, we have determined that dietary nitrate supplementation could benefit recreational to moderately trained athletes during endurance performance. However, as the caliber of athlete increases, the ergogenic effects of dietary nitrate supplementation appear to diminish. Although this is the case, 500ml of beetroot juice, or a more practical option of two small Beet-it shots, two and half hours before an endurance competition certainly won’t hinder exercise performance and with the potential to facilitate it, it seems like a win-win situation. If all else fails, never rule out a potential placebo effect. Mark holds a BSc (Honours) degree in Sport and Exercise Science and an MSc in Sport and Exercise Nutrition from Loughborough University. He is currently working as a Performance Nutritionist for the England and Wales Cricket Board with both the England Women’s Academy and Midlands Regional Disability Cricket squads. Additionally, Mark is a graduate member of the Sport and Exercise Nutrition Register (SENr) and an ISAK Level 1 Anthropometrist. BAILEY, Stephen et al. (2010). Dietary nitrate supplementation enhances muscle contractile efficiency during knee-extensor exercise in humans. Journal of applied physiology, 109, 135-148. CERMAK, Naomi, GIBALA, Martin and VAN LOON, Luc (2012). Nitrate supplementation's improvement of 10-km time-trial performance in trained cyclists. International journal of sport nutrition and exercise metabolism, 22, 64-71. JONES, Andrew (2013). Dietary nitrate: the new magic bullet? Sports science exchange, 26 (110), 1-5. LARSEN, Filip et al. (2010). Dietary nitrate reduces maximal oxygen consumption while maintaining work performance in maximal exercise. Free radical biology and medicine, 48, 342-347. NAIR, Sreekumaran, IRVING, Brian and LANZA, Ian(2011). Can dietary nitrates enhance the efficiency of mitochondria? Cell metabolism, 13 (2), 117-118.